Liven up your living room with this Mellow Yellow Throw. Bright and colorful, this crocheted afghan pattern is great for beginners and is a fun way to instantly transform your home decor. The openwork lacy look of this afghan makes it perfect for all seasons. 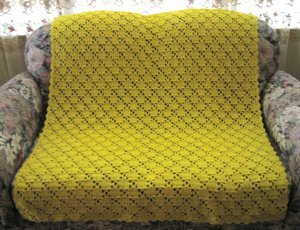 You could make one in your favorite color or add a flair of vibrant color to your couch or bed with this bright yellow yarn. Let the sun shine in year round with this fantastic and fabulous crochet afghan pattern! Special Stitch: V Stitch (V St) – (dc, ch 4, dc) in space or stitch as indicated in instructions. Note: Design is crocheted in multiples of 10 plus 7. Row 1: Ch 157, dc in 4th ch from hook, dc in each of next 3 chs, [skip 2 chs, V St in next ch, skip 2 chs, dc in each of next 5 chs) across, turn. Row 2: Ch 3, dc in each of next 4 sts, [ch 2, sc in ch space of V St, ch 2, skip dc of V St, dc in each of next 5 sts] across, turn. Row 3: Ch 3, skip next st, V St in next st, [skip next 2 sts, 2 dcs in next ch 2 space, dc in next st, 2 dc in next ch 2 space, skip 2 sts, V st in next st] across to last 2 stitches, skip next st, dc in last st, turn. Row 4: Ch 5, sc in ch space of V St, ch 2, [skip dc of V St, dc in each of next 5 sts, ch 2, sc in ch space of V St, ch 2] across, dc in last st, turn. Row 5: Ch 3, dc in ch 2 space, dc in next st, [2 dcs in ch 2 space, skip 2 sts, V St in next st, skip 2 sts, 2 dcs in ch 2 space, dc in next st] across, dc in last ch 2 space, dc in last st, turn. Color Scheme: Repeat Rows 2 – 5 for pattern for a total of 66 rows. Work along top edge (sc, ch 3, 2 dcs) in right corner dc, [skip 2 dcs, (sc, ch 3, 2 dcs) in next dc, (sc, ch 3, 2 dcs) in next sc] across, (sc, ch 3, 2 dcs) in last dc. Work along side edge [sc in space between 2 rows, (sc, ch 3, dc) in space between next 2 rows] across, (sc, ch 3, 2 dcs) in first bottom ch. Work along bottom edge [skip 2 chs, (sc, ch 3, 2 dcs) in next ch, (sc, ch 3, 2 dcs) in ch below V St] across, (sc, ch 3, 2 dcs) in last corner ch. Work along side edge [sc in space between 2 rows, (sc, ch 3, dc) in space between next 2 rows] across, join to beginning sc and fasten off. There is no v-stitch in the throw shown here. Looks like the instructions and the photo got mixed up here. I like the photo throw though. The picture of the completed throw is not the same pattern as the close up photo presented here.